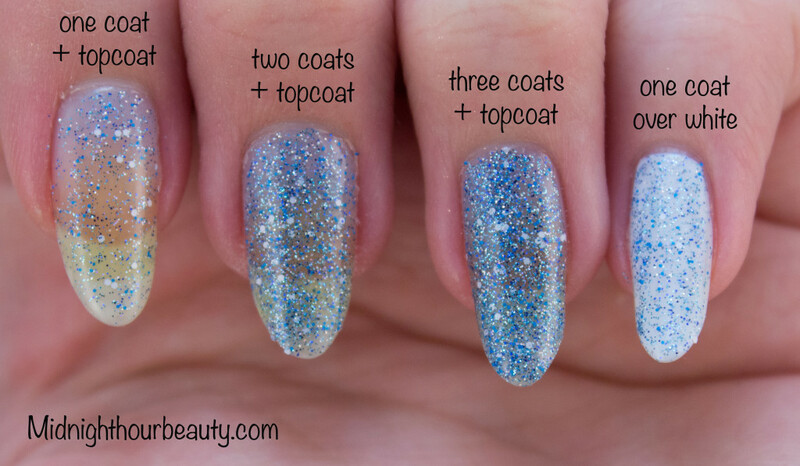 Nail polish junkies are constantly looking for fun ways to feed their obsession, and participating in a polish swap is the perfect solution. Two lovely Instagram ladies (@canaildian_girl and @mynailsdid) organized A Very Canuck Swap, which is a polish swap for Canadians only. There are two categories to enter, $25 or $50, and each participant buys a minimum amount worth of polish (depending on which category they choose) for another swapper. It’s basically like Secret Santa, so the fun is all in the surprise. You can also add in extra goodies, on top of the minimum polish amount. 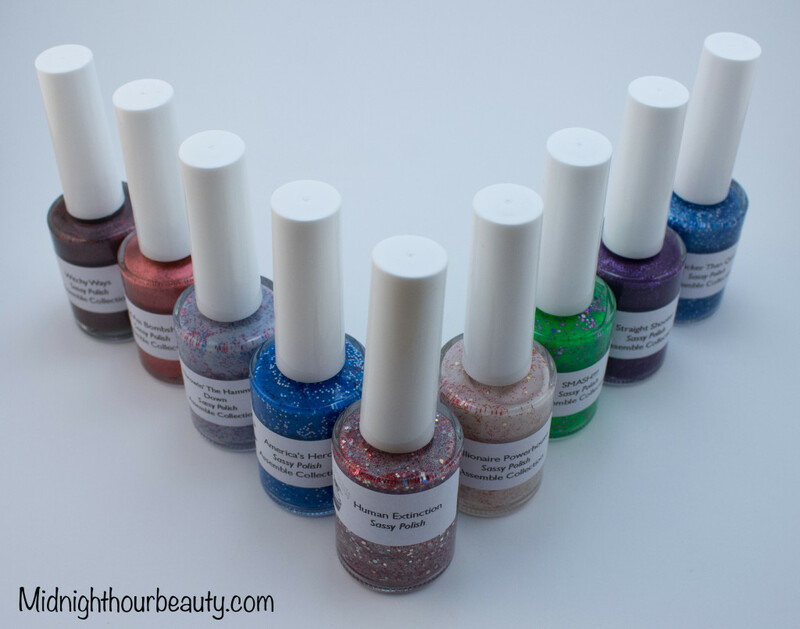 Putting together a box full of polishes that your swap partner will love, and then waiting for the box to arrive on their doorstep, is such an enjoyable process. You also get to meet a bunch of amazing ladies along the way. I participated in the $25 category when the first swap took place in February and it was a huge success. This time around, we had even more participants, and I moved up to the $50 category. I mailed my swapper’s box on Friday and it should arrive at her house any minute now. I also woke up to my own box at my doorstep this morning! As I unwrapped my box, it was like a nesting doll – each layer of wrapping revealed another beautiful layer underneath. I was thrilled to see a Sephora gift box at the bottom of all that wrapping. These boxes are perfect for organizing makeup, so this is a welcome addition to my collection. The top layer of the box contained a nice card from my swap girl, Annie (@anniepolishes), as well as some yummy Starburst candies and gummy bears. The box also held some sweet-smelling extras: Bath & Body Works Sweet Pea Body Lotion and Japanese Cherry Blossom candle, ORLY Rich Renewal Hydrating Crème, and Clinique Happy. The ORLY crème feels so nice on my hands and the Clinique fragrance is a nice light summer scent. 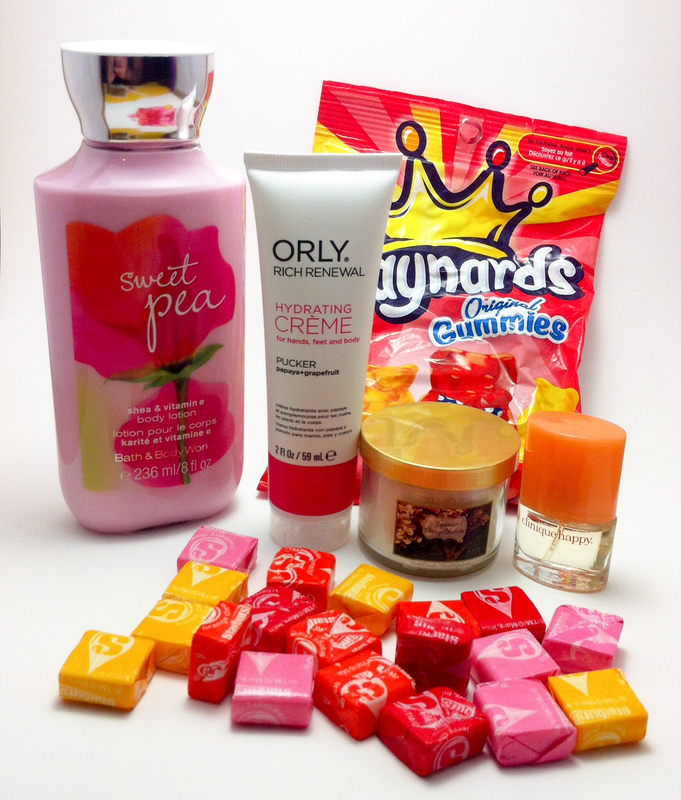 Plus, who doesn’t love Bath & Body Works products? 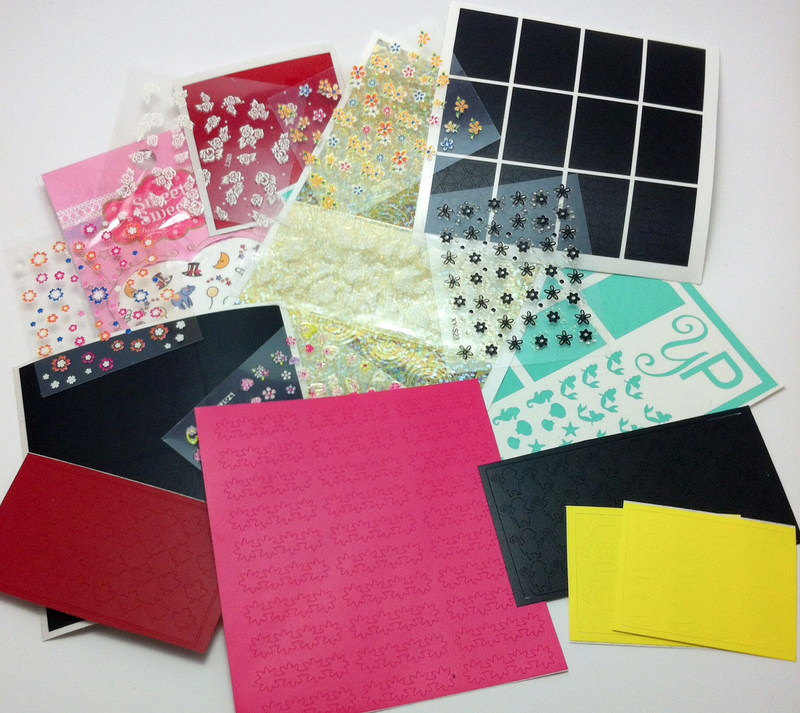 One of the most thoughtful aspects of this swap box was the massive supply of nail stickers and vinyls. Annie did her research and ordered custom decals of some of my favourite things. My Nails Did Vinyls created these adorable custom vinyls of monkeys, bananas and daisies. Also included were maple leaf decals, which will be perfect for Canada Day celebrations. There were also spiral stencils, triangle stencils and ladybug decals from Eat. Sleep. Polish., spiral stencils and a mermaid decal/stencil set from YouPolish, and a variety of flowers and other cute nail stickers. I’ve been using a lot of vinyls in my nail art recently, so I can’t wait to try all of these. Included in this picture are two containers of red and yellow loose glitter, a wax pencil for picking up rhinestones (these little guys are super handy), and some much-needed cuticle remover. Now for the main event: the polish. Annie really outdid herself with this selection of polish. Urban Outfitters’ Blue-Tie – This is a gorgeous deep blue with a subtle shimmer. Finger Paints’ Leonardo’s Lime – A spring green crème that will make a great addition to my FP collection. KleanColor’s Chunky Holo Fuchsia – I love how this colour changes depending on the lighting. It’s a deep reddish-pink jelly with orange holographic microglitter. So pretty. MISSHA The Style Crystal Nail Polish in JBR01 – I don’t entirely know how to describe this colour, but I really like it. I guess you could say it’s a light brown with a hint of purple, but the holographic finish gives this colour a whole new dimension. The adorable heart-shaped bottle comes with an extra wide brush for easy application. I’m really looking forward to trying this one. 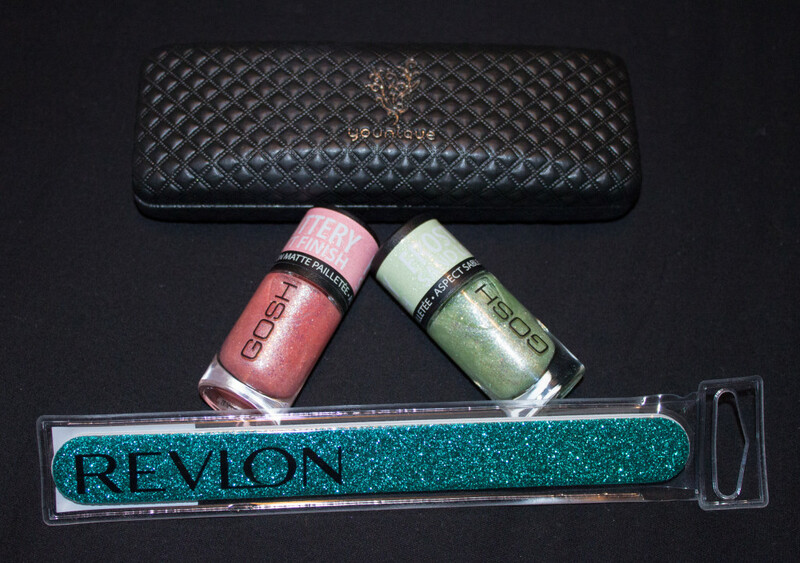 Beyond the Nail’s Comet – This green polish is from the 2014 Summer Galaxy Collection, which featured all neon, holo jellies. It doesn’t get much better than this. Coco & Lulu’s Pied a Terre – I have an unhealthy obsession with Cake Beauty’s Delectable hand creams, and I had no idea they have their own polish line. I have no doubt I’ll love this taupe crème polish just as much as Cake’s hand creams. Avant Garde Lacquer’s Big Red Candle – This sultry red polish has the perfect amount of shimmer and looks so pretty in the sunlight. Sally Hansen’s Pacific Blue (original formula) – Everyone knows the perfection of this colour and formula, and you can never have too many. ORLY’s Sugar High Collection: Frosting, Cake Pop, Key Lime Twist, Sweet Dreams, Candy Shop, and Plum Sugar – This whole collection is just beautiful. I’ve had my eyes on it since the day it was announced and I am so excited to finally own it. I can’t even pick a favourite; they’re all just amazing. Overall, I am absolutely blown away by the contents of this swap box. Annie did a great job picking everything out. I love it all. Thank you so much, Annie!